Very much prefer this form of Curcumin, great quality, great value. I will be buying CuraPro 375 mg by EuroMedica again in the future. 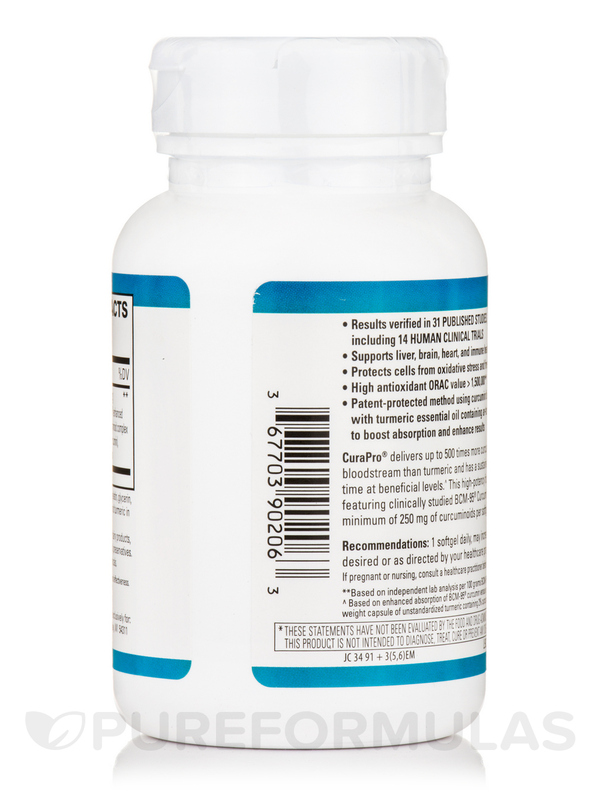 CuraPro by EuroMedica helps tremendously with arthritic pain which I have in my shoulder and elbow. When I don't take these for a week I notice the difference and the arthritis pain starts to creep back. CuraPro® is up to 500 times more powerful than turmeric‚ and has a sustained retention time at meaningful levels in the bloodstream. 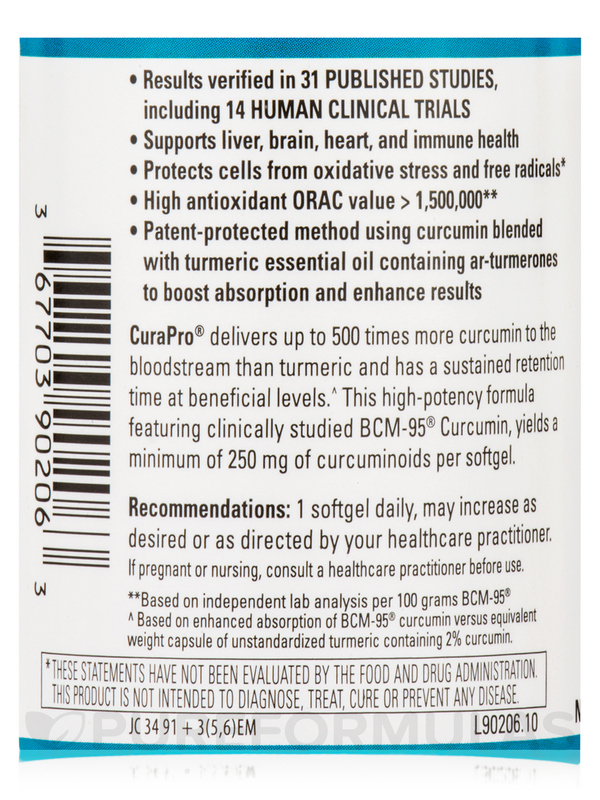 This high-potency formula‚ featuring clinically studied BCM-95® Curcumin‚ yields a minimum of 250 mg of curcuminoids per softgel. 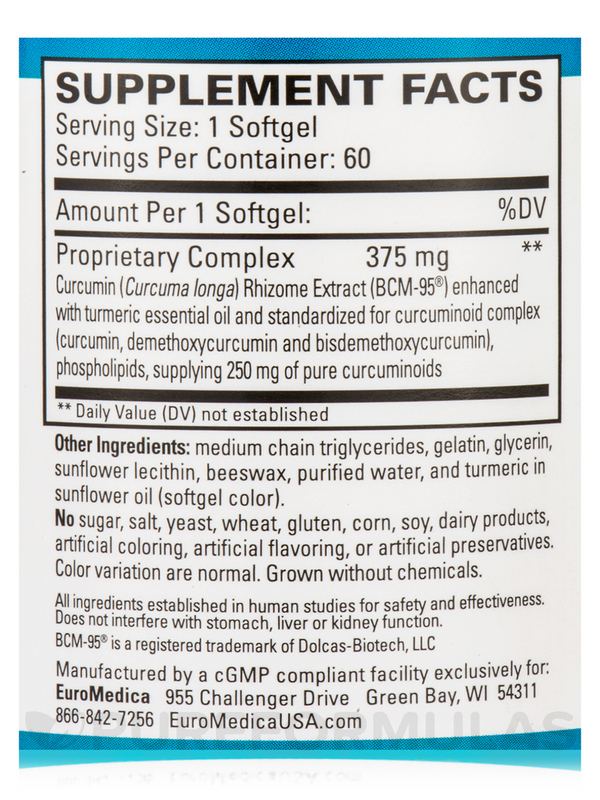 Curcumin (Curcuma longa) Rhizome Extract (BCM-95®)‚ enhanced with turmeric essential oil and standardized for curcuminoid complex (curcumin‚ demethoxycurcumin and bisdemethoxycurcumin)‚ phospholipids‚ supplying 250 mg of pure curcuminoids. Other Ingredients: Medium chain triglycerides‚ gelatin‚ glycerin‚ sunflower lecithin‚ beeswax‚ purified water‚ and turmeric in sunflower oil (softgel color). If pregnant or nursing‚ consult a health care practitioner before using. 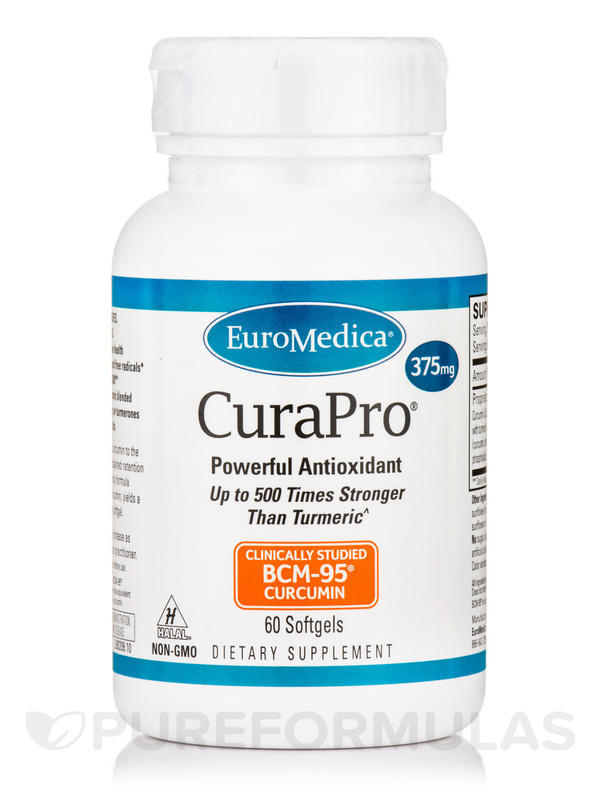 I use CurePro 375 mg by EuroMedica daily and my feet and ankles do not swell anywhere near as much. 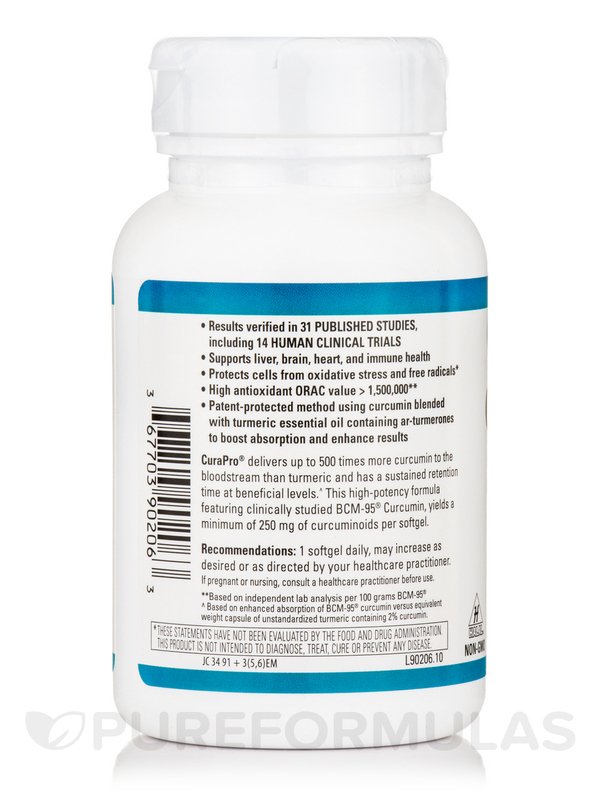 CuraPor by EuroMedica has helped me with GI discomfort to some extent for the first couple weeks. My GI problems returned after two weeks. I ordered this on the advice of my naturopathic doctor. I started out with the 375mg dose to see if I would have any adverse reactions and I had none. I am now taking 1500mg/day (per Drs advice) to help with my breast cancer aftercare. 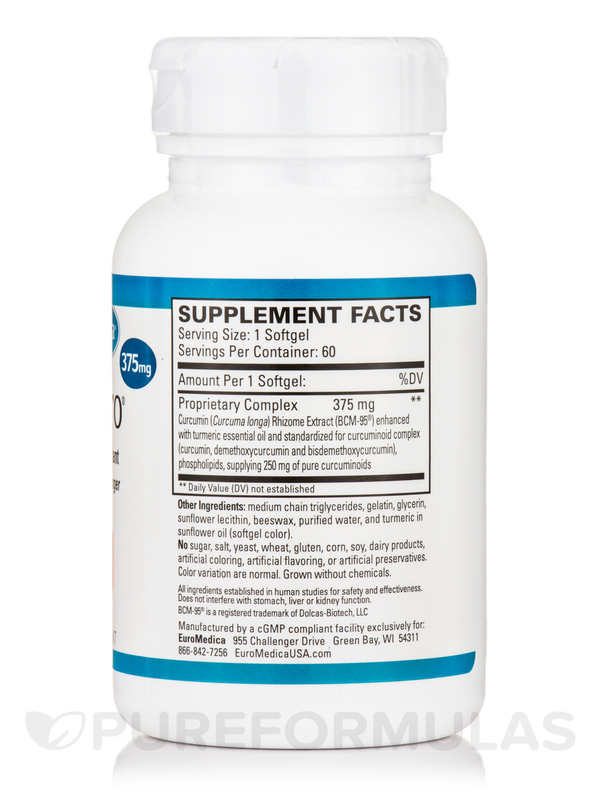 Its very pricey but curcumin is a difficult supplement to really get any benefit out of. This one has studies behind it which is why my ND chose it. I have already reordered and will continue to do so. very concerned about side effects after having severe reactions to antibiodics should I be worried? Hello Cindy, thank you for contacting us. I recommend you to consult a health care practitioner before using.